At school, the Biology lab with its mercury vapour lamp and slightly smelly combination of plants, fruit flies, toads and spiny mice seemed a strangely cozy and welcoming place. Our teachers, Mr Hugall and Mr Allen, made biology seem easy, interesting and important. I feel I owe them so much. 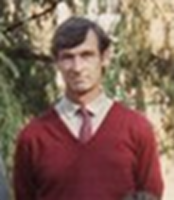 One of my Biology teachers, Mr Allen, seen in 1989. The most important thing I learned was that science wasn’t just about facts that someone else had already figured out, it was about finding the answers to new, unsolved mysteries. We were lucky to get to design and run our own experiments for the first time as part of our A-level. It’s a bit hazy, but I did mine on human hearing and looked at the accuracy with which people could tune one frequency to match another. Nearly 30 years later, I am still fascinated by the biology of human behaviour, still designing and running experiments. And now I am teaching my own students, and they’re going on to devise and run their own experiments and making discoveries of their own. I know that at least one member of my small A-level class of six or seven went on to a career in cancer research and several others including myself went on to degrees and research careers in the biosciences. That was just one year, so there must have been many, many more. Today I learned that when Mr Allen was diagnosed with a large lymphoma in his chest, his life was saved by treatment with a new, potent and highly selective drug. I am happy to say he is fit and well. It seems karmic that he was able to benefit from the science that he’d spent so many years working to inspire. His son, Jeremy, who was in our class, is now doing a sponsored triathlon for Leukaemia and Lymphoma Research. So it seems like a good opportunity to me say a proper thank you to my teacher, and to inspirational teachers more generally. And I hope that if you’ve been inspired by a great teacher, you’ll consider making a donation, too. British PhD-qualified scientists are amongst the most productive in the world, so why are so many being forced out of scientific research by an unstable career structure? The tailwind and the headwind. It’s probably not apparent to the outside world, but scientific research is a cut-throat business. Most research funds provided by government and by charities are allocated through a competitive process where different scientists’ plans and track records are compared, with a few winners getting all the money and everyone else getting none. A good application takes months to prepare. Each rejected application represents a significant waste of resources. This process is repeated over and over again. Those who are consistently successful will go on to long and productive careers in research, but many scientists who don’t win their own funding will eventually have to give up. No doubt in many cases they will go on to fulfilling careers in other sectors. But this is a great pity because by this stage they will have often have gained highly specialised skills and extensive experience which will be lost to the economy. There are a wide variety of different funding schemes, but to even qualify for the entry one must have a PhD and typically several years of postdoctoral experience. Because most applicants are so highly trained and experienced there are a large number of excellent applications, and the funders are obliged to choose a small proportion (10-20% for projects, as little as 3% for highly competitive personal fellowships) and reject all the rest. Inevitably some of these decisions can seem rather arbitrary even to those who make them. “Whoever Said Life Is Fair? Of course, this luck applies equally to all scientists. So is Athene Donald’s “whoever said life was fair” a rational response? Are funder’s really “doing the best that can be done with the money available”? I don’t think so, or at least, I don’t think we can be at all confident about it.Funding competitions are won, not on the basis of an individual’s capacity to become an effective leader or to deliver great science but based on a combination of skill and luck. In a highly competitive system, only those who are both excellent and lucky will gain funding. Those that are excellent and unlucky may not gain funding. This much is acknowledged in Prof. Donald’s post. Skill cannot be assessed directly, but is evaluated on the basis of scientist’s track record and the quality of the proposal itself. The track record plays an important part in the judgement. If funding leads to increased output then it follows that those who have been funded in the past will have a stronger and more competitive track records when it comes to future competitions. The lucky and excellent are likely to outcompete those who are merely excellent. It is even conceivable that a fairly good but very lucky applicant might beat an outstanding but unlucky one. Over time, the small initial impact of luck could easily be amplified. In other games of skill and chance, we take steps to avoid the arbitrary advantages that can accrue from good fortune. For example, in poker it is advantageous to sit immediately to the right of the dealer. The dealer is initially chosen at random, but the position rotates with every hand, so that no one player gains an overwhelming advantage from where they happened to sit down. Similarly in football it is more difficult to play against a headwind. A toss of a coin decides the initial direction of play, but it is reversed at half time to reduce the effects of chance on the outcome of the match; there is an advantage to playing at home, so important games are played out over two legs or at a neutral venue. In the league each team plays each opponent at home and away. Scientists are similarly careful to avoid bias in the design of their experiments. For example, psychologists are trained to counterbalance the order of conditions in an experiment, because learning or fatigue that builds up when performing one task might affect the performance on a subsequent one. Without detailed evidence or a mathematical model (coming soon), it is difficult to tell whether an accumulation of random factors leads to suboptimal funding decisions, but it certainly seems possible. I am not sure how far funders consider this issue. To what extent are current funding structures reinforcing luck at the expense of skill? Are there any further steps they could take to reduce any cumulative inequity in their decision-making and improve the overall quality of science they deliver? I think the jury is out. I regularly commute to work on my bike. I always notice a headwind but I am rarely aware of a tailwind, it just seems easy sometimes. But the wind is still there. No one ever said that life was fair, but where it is unfair, we can and should try to make it better. Author tomhartleyPosted on September 17, 2011 February 11, 2013 Categories Reform & Rants, ScienceTags bias, careers, funding, matthew effect3 Comments on The tailwind and the headwind. ThermalToy Create a free website or blog at WordPress.com.